1000 Fights : Interview with Mike & Luci : Get Inspired! Get Inspired! by 1000 Fights! Do you think you and your partner fight all the time when you are on the road? Can’t imagine spending days together at a stretch? Need inspiration for fights as well as travel? You will find plenty of that in our Get Inspired! interview with Mike & Luci from 1000fights.com. Mike & Luci met in 3rd grade, started fighting in 6th grade, and haven’t stopped stopped since. Several years down the road, they decided to combine their love for travel and fighting with each other to entertain the rest of us. You can learn more about Mike & Luci’s fights via 1000Fights.com, Facebook, Twitter, and YouTube. We are the Fighting Couple! Ok¦Maybe that is a bit dramatic. We do disagree, but what couple doesn’t when they travel? We love to fight. We also love to travel. So naturally we decided to combine the two and share the outcome with the world. We started our blog: 1000 Places to Fight Before You Die, to encourage couples to get out and travel together. Our travels together have enriched our relationship, taught us much about each other, and made our marriage stronger. We highly recommend it¦the travel part¦not so much the fighting part. When we were first married, Mike planned the honeymoon. On our way home Mike said, œso it’s your turn next year to plan a trip. Every year we take a œbig trip together. For each year we are married, we add a hundred dollars for airfare. So each year we take turns planning where we go. We work together on the details. It really gives us some couple time away from kids. So many of our good travel mates embark on serious RTW treks.They hit hundreds of places in a matter of two weeks. We salute them! Some sell everything they own and work on a papaya plantations in South America for 10 years. Not for us. We have chosen to take a more measured approach for a couple of different reasons. First, we do a tremendous amount of research on the locations we pick. We learn the language, read tons of books on history of the locale, and have even taken college courses on countries. When we get to a location, we tend to mock those that seek out tour guides. If we don’t have a baseline understanding that a guide could offer, we are wasting our time at that location. (The only exception is Context Travel, which we highly recommend for obvious reasons). Secondly, we want to travel for many years to come not just in the short term-and we also really like the money that real jobs offer. We plan out trips a year in advance! We are a little over the top when it comes to prep for our trips.We have taken college courses on the culture and religion of a location.We learn the language¦.ok Mike learns the language. We will let you in on a little secret, we HATE tours. HATE them! If we don’t know what the average tour guide knows by the time we get to a location¦we have failed. Advanced planning also helps us keep costs down, and employers happy. We don’t go on vacation to relax. Maybe that’s why we fight? We are up at the crack of dawn. We study out our locations and search out the lesser known sights. We really get to see some amazing things. More importantly, we have met some amazing people. Take for example, we arranged to stay at a humble bed and breakfast in Swaziland. The innkeeper, an impressive woman, shared with us her triumphs and trials. A place that we will never forget. So, what’s on your must carry list? First off, you should know that Mike packs more clothes than Luci. With that out of the way, some key things that we always pack: GPS (saved our bacon, and prevented a ton of fights). We like to make an in depth day by day trip folder. It includes restaurants and ratings, agendas, even souvenir recommendations from other travelers. We know that this makes us sound less than spontaneous¦but we like know what our options are. If we hear about something else to try while on location, we make it happen. Tell us about your best and worst culinary experiences. Hands down, the best food we have eaten on the road was at the Hotel Monasterio in Cusco, Peru. They specialize in traditional Peruvian Fare, and while it is not cheap by any stretch it is sooo good. 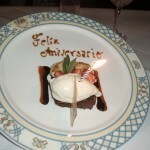 They even made us a wedding anniversary desert! has to be in England.We have never had a good meal in England. I know that they must have somewhere good to eat. People have been eating in England for centuries. We just have never found a good place¦Bangers and Mash just doesn’t do it for us. Any good recommendations without spending over 100 Pounds? So many! The Zulu warrior that helped us get to meet the Zulu King. Our tour guide in the Amazon who spoke amazing English¦at one point of the tour he said, œthe process is called Eutrophication. You know Eutrophication? We busted out laughing. Here is someone speaking our language, using 14 letter words. Amazing! Another great one¦we were at a museum in Savannah Georgia, we asked the curator about purchasing a print that was sold out. He said, œI know the painter, let me call him. He did. The painter, doctor and Lafettyette afficianto a stranger to us. Invited us to his home for an afternoon discussion on southern culture, American revolutionary history in the south, and painting. We ended up having one of the most amazing afternoons! How has this trip changed you as a person? Travel has made us different people in just about every way. We are better citizens of our own country. We are better parents. Traveling for us is like air. We thrive on adventure. We like what we learn about the locations we visit, but we love what we learn about ourselves. We have a stronger relationship as a result of our travel. We have more questions than answers after our travels. We can’t help but think a little of the world has rubbed off on us as we trek. Our travel blog has enabled us to meet some truly dynamic people. Yes, traveling opens a lot of doors, but sharing that experience and encouraging others is priceless. Bosnia next month! We can’t wait! Then we have two continents left so Australia and Antarctica. My advice is simple. Go. If you lack the financial ability to go international, explore your city, your state or your own country. Discovery is so refreshing. With that said, what advice for traveling couples? Its ok to fight. It is really ok. Fighting is a clash of ideas and opinions. The fact that you both feel strongly is to be celebrated. I don’t know how many times one of us has said, œI want to go see this. The immediate response for the other is why? A discussion of why a given topic is important ensues. You learn so much from this exercise. You learn about your spouse’s likes and dislikes. You learn about their passions. Traveling is a microcosm for life. You must budget, agree on directions (thank goodness for gps!) set priorities and work together. Recognize and enjoy those aspects as you travel. The best part of fighting is it gives you an excuse to make up (we wont offer any advice on that topic, we will leave it to you!). What are your thoughts on traveling solo as opposed to traveling with a partner/friend/group? Go with your loved one! There is nothing like watching the Tuscan sunset holding the hand of the person you are madly in love with.Share your adventures.Make them the topics of discussion throughout the year¦remember when we¦¦ Solo travel is ok, but who would you fight with?